I want to write out my weekly taxi driving schedule...just to believe I actually do it. It's kinda crazy, but I'm sure if you're a mom, you probably do it daily too! 3 kids, 3 schools...throw the nephews into the mix and add a 4th school. Thanks to hubby working in our small town, I only take the kids to school maybe once a week, so that part adds to his schedule before work. We can walk to the kids school and FiFi's soccer but there is SO much back and forth with 3 kids! I feel your pain, with soccer, lacrosse, swimming, flute and rock climbing we sometimes don't get home until after 8:30. IT'S INSANE!! 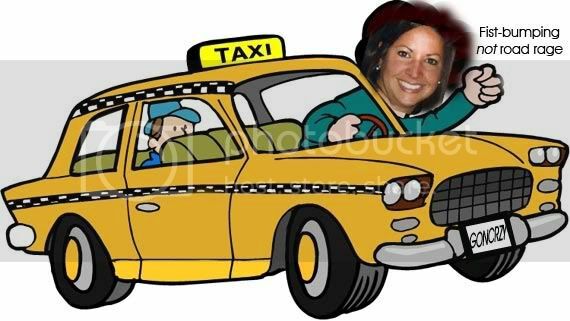 Girl..you know that I am taxi-in just like you are...I can barely keep it all straight!!! Once my car starts in the morning, it is going all day long...I need a HYBID Stat!!! ;) Love this post and your adorable little face hangin out of the taxi! yeah- what exactly do you do with all your free time now that the kids are in school? Mine are still young enough that it hasn't gotten that crazy...yet. I know it's coming! Wow, you do have a busy schedule! I love the picture!!! Great picture. I can't believe all the driving you do. I sometimes feel like a taxi driver too. I don't have as many routes as you do, but I always feel like I am in the car. Happy ATWT and take care. You're looking pretty darn hawt in that there taxi! Wow, and I thought I was busy. Good gravy, does it ever end? You give the true meaning to on the go. I only have one, but I totally feel you! Except instead of soccer & dance class we are going to doctors & therapist. Either way, gas cards are a good idea!! Crap. What age do they start doing all that stuff? I'll take the potty training and high-chair cleaning while I can - whoa Momma! Thanks for the reminder about how HAPPY I am that we moved far enough away from the schools for my kids to ride the bus!!! yikes that is crazy Jen, serenity now! Yep just having one of those days wher eyou click on the wrong link and comment on the wrong post! You are one busy mama and you definitely need that gas card! You are certainly in that busy season of life when you are in the car more than you are in house! This too will pass but I clearly remember those days. Get you an Ipod and download some great music or some wonderful sermons and at least keep your mind ocupied while you sit in the car lines! Girl, that is some schedule. Whew. Holy Macaroni....that is some kind of schedule. Love your taxi shot! Cute pic. I'm glad mine take the bus - lol! That? Is crazy. I'm sure I'll be in the same boat one day...soon! Now, way before I had children, I thought stay-at-home-moms had it easy. Um... now I know better. Preaching to the choir, of course, but I have to admit it's easier for me now that Kyle has his own car! Hooray!! That's the one thing I'm NOT going to miss, is all the chauffeuring, once I start work. School, playdates, programs... I lived in my minivan. Thank goodness the kids are amenable to taking the schoolbus now ... whew! Whew! You are going to need new tires by October at that rate! DQ goes to dance 3 days/week? Is she on a competitive team or something? Around here, dance classes are routinely a once a week thing. How many years until your first one turns 16? I was always the first person in the DMV office, the second it opened, with my party hat on and my streamers attached, shouting YEAH at the top of my lungs. Only the first insurance bill could dampen my excitement.